Lately there has been an interest in the year 1968 because of Tom Brokaw's book and TV documentary. He didn't tell a hundredth of the story. I spent that whole year at Redstone Arsenal AL as an inmate of the US army and there I made friends who have remained my friends ever since. There's something about stupid wars and the threat of imminent death that make camaraderie essential and true. One day in the autumn of that year some friends and I, well-fortified with some excellent inspiration I had received in the mail from an army buddy back at Fort Bliss TX, decided to spend the afternoon in a piano room at the enlisted men's club making music. Three of us were musicians of sorts and, although we had never played together before, we felt we were on a similar plane and could probably jam as well as the 4F guys in Hollywood who were putting out "Supersession" albums. So, with me on my 1966 Gibson ES-335, Rick Murphy on the piano and Peter Blue on the comb and tissue and vocals, we started playing. Chris Clement had brought along a jury-rigged tape recorder with echo and recorded the whole affair, of which a short segment is provided for your listening enjoyment. Others attending were Rockee (soon to be Peter's wife) and John Lennon (no, not that John Lennon). The song was completely ad lib and as Peter states, called "Late Again", followed by something that must be known as "High Plateau". After the session we went back to our dreary military jobs, survived the debacle that was Vietnam, and have lived exemplary lives ever since, in spite of the machinations of Nixon, Ford, Carter, Reagan, Bush, Clinton, Bush and whoever next will keep sending young people off to fight for their mistakes. Ladies and gentlemen, may I present Toehold performing their only hit, "Late Again/High Plateau". In 1973 -- or was it 1974? 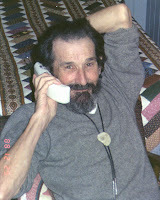 -- I was living in Farmington New Mexico playing with Bill Smith (bass) and Gary Nabors (drums) -- or was it John Cunningham? -- at Dizzyland Liquors. It was a great place to play. The bar owners, Georgia and Sterling Patterson, were the best bosses I ever had during my 25-year bar band career and we would have a lot of fun playing whatever the hell we wanted six nights a week. I can't imagine music being as fun these days. We knew hundreds of songs but we still used to get a little bored playing them so we had a gimmick we used quite a bit: we'd take a standard song that was in a normal major key and play it in a minor key; or vice versa. Or we'd take a raucous song like Louie, Louie and play it using all major seventh chords, which musicians know are smooth, jazzy chords totally unsuitable for anything but ballads and haunting love songs. It was incredibly jarring to hear the saucy words of Louie, Louie, or Brown Sugar or Satisfaction sounding like The Four Freshman backed by Guy Lombardo were singing them. I wish I had more recordings from that era -- as well as a picture of the band -- but I recently did find an old reel-to-reel tape recorded at Dizzie's and one of the songs on it was Miller's Cave, a classic C&W tune written by Bobby Bare. Since the song is about a man who, upon finding his woman cheating with another man, kidnaps them both and drags their bodies into a dark cave, we figured the song needed to be in a dark, minor key instead of the major key it was in. So here it is, in all of its minor-key ominousness. By the way, I think this sounds pretty damn good for a three-piece band. Bill Smith played bass and harmonica AT THE SAME TIME as well as back me up with some harmony vocals. I am sorry that I can't remember, or identify, whether it was Gary or Johnny on the drums. They were both excellent and I sure wish I knew what they did with the rest of their lives. Bill is still in Farmington and is one of the best guitarists I EVER heard. Like the egotistic fool I was, I played guitar the four years we played together and he played bass, and yet he was always twice the guitarist I was. He could play like Jimi Hendrix almost before Jimi could. Check it out. And turn it up. For the past year or so I've been receiving in the mail copies of the Bean Home Newsletter, the newsletter for the Freddy The Pig club, of which I'm a proud member. I loved Freddy as a kid and I have all of his books and occasionally read one for fun. 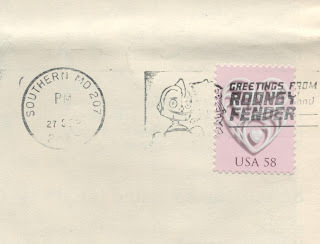 But I've been mystified by the postmark on the newsletter, which shows a couple of cartoon robots and the words GREETINGS FROM RODNEY AND FENDER. Am I the only one getting this postmark? Is it a special message from Freddy to me? Or is something more sinister going on? Note the date: 2005. I'm so out of touch with modern culture, if that's what you can call it. What a letdown. How the hell does a children's movie rate -- with a federal agency? And why? I play guitar and back in the 60s, 70s and 80s it was how I made my living. I used to know the chords, words and arrangements to over 2000 songs but now I just noodle around playing wild fuzz solos over simple chord patterns. I play maybe two hours a week and consequently I am one of the most undisciplined guitarists you'll ever hear. But I've developed a way of playing "harmonics" on the guitar that I don't think anyone else plays the same way. Harmonics are bell-like tones you get by touching the string at the same time you pick it. At least that's one way of playing harmonics. ZZ Top, Eric Clapton and Roy Buchanan have used harmonics on their recordings a lot. Probably many others, too -- I dunno, I haven't listened to music in decades. So if you're an electric guitarist and want to play some wild sounding harmonics, you might try doing them the way I do. The picture above shows that as I pick the string on the upstroke, I also hit the string (lightly) with the pad of my fourth (ring) finger at the same time, about an inch down the string from where the pick hits it. 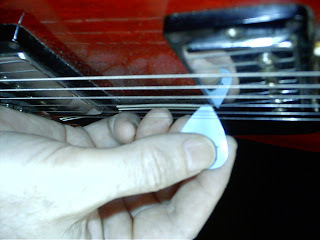 NOTE: I can only do this on an upstroke of the pick. This means I can't play harmonics very fast. Perhaps you can figure out how to do it on the downstroke too and play harmonics like a demon? By hitting the string at two points at the same time you get a bell-like tone, the pitch of which is determined by the fret you're playing AND the length of the string from where my ring finger hits the string and the bridge. It's the two pitches sounded at the same time that gives the ring modulation (bell-like tone) that we call harmonics. By moving my right hand a different distance from the bridge I get a completely different pitch even if my left hand is playing the same fret -- or open string. Here is a link to a simple boogie that I play on my Fender G-Dec amp that is straight for the first verse and has a bunch of harmonics on the rest of the song. Note that in order to get the harmonics to ring out nice and loud you need to have a treble, hot sound on your guitar. My harmonics are probably very hard to do on an acoustic guitar. Surely any guitarist who practices regularly and knows some good licks can take this technique and make something really good out of it. I only play at home and I'm sure my family wonders why those obnoxious bell-like tones keep annoying them from the depths of my book room. I was reading an article on the op-ed page in the NY Times today about a scheme to insure that voting machine results hadn't been changed. It is so simple, and elegant, that as I read the article I kept getting more and more excited about it. And when I finished I looked up to see who had written it and it was William Poundstone, one of the founding fathers of the Harry Stephen Keeler movement. 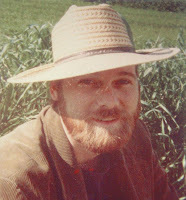 He even won the Imitate Keeler Contest this year with a story that I consider the quintessential Keeler pastiche. The scheme involves giving out random paper proof of how a person voted -- but not to the person. To a different, randomly selected person. The main argument against paper proof is that people can be intimidated if they have a proof of how they voted on their person. Or if they throw their paper proof away, someone unscrupulous can find it and change that person's vote, knowing that the paper proof is in THEIR possession, not the voter's. According to the article, handing out as few as 50 randomly selected paper proofs can prove voting fraud in any size of election. I love simple elegant schemes and algorithms. 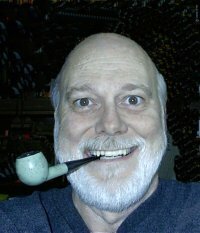 Nero Wolfe used to use them and I always wondered why police departments and detectives didn't study Nero Wolfe's techniques to trap criminals, rather than use the stupid sting operations they use now that are usually entrapment. My congratulations to Bill Poundstone for using his considerable brain to solve a problem that would have befuddled politicians for centuries. Harry Keeler would have been proud. Please check out the article if you get the chance. Isn't it great when science beats the hell out of faith? I subscribe to the NY Times so maybe this link won't work for you, but give it a try.